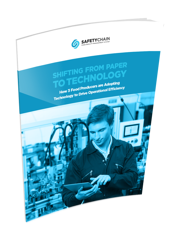 In this exclusive ebrief, learn how leading food manufacturers and processors have made the switch from paper to technology solutions to manage food safety and quality data. Doing so has not only helped them transform compliance and program data into operational improvements, it has enabled them to catch and manage issues earlier and control costs by minimizing reworks, waste, customer returns, and recalls. This quick read is packed with insights, valuable tips, strategies, and lessons learned.